Scouts are a very unheralded but important component of a successful baseball program. They spend hours following kids and are expected to project how they will perform when they become men. Not exactly a precise science. Believe Lewis captured Chooch perfectly. He’s developed into a quality catcher and clutch hitter and will be behind the plate again for the Phillies after signing a three-year contract last week. His ability to handle a pitching staff, both veterans and youngsters, is so vital. Bringing in another catcher would have created a major learning project, especially with the addition of a new pitching coach. Chooch knows his pitchers and can help a youngster like Miguel Gonzalez. Catching 110 games this season will put Chooch at 900 on the Phillies all-time list. He’ll be behind Jack Clements (953 games), Darren Daulton (965), Bob Boone (1,095), Red Dooin (1,124) and Mike Lieberthal (1,139). Of that group, Clements has the highest lifetime batting average (.289), followed by Lieby (.275) and Chooch (.274). It is difficult to gauge Clements’ career numbers because he played from 1884-1897. We do know he is the only left-handed throwing catcher in Phillies history. Boone, Daulton and Lieby are the only catchers in the Phillies Wall of Fame. Someday, Chooch will be the fourth. After all, he’s the only catcher in Phillies history to be behind the plate for two no-hitters. With Brian McCann bolting for the Yankees, Chooch is the premier catcher in the National League East now. McCann was a Phillie killer who loved to hit in Citizens Bank Park. We won’t miss seeing him. The Phillies faced multiple needs this offseason. Two needs have been filled in Marlon Byrd and Chooch, a pair of right-handed bats. HAPPY THANKSGIVING….Gobble till ya’ wobble! Seven years ago the Phillies drafted a pair of multi-sport high school athletes. Taking different roads, each is now a budding star in Philadelphia. Say hello to Riley Cooper and Domonic Brown. In the 15th round, they selected Cooper, an outfielder out of Clearwater Catholic High School, not far from Bright House Field. Cooper opted to play football and baseball at the University of Florida. The Texas Rangers drafted him in the 25th round of the 2009 baseball draft and he initially agreed to terms with the American League club before having a change of heart and returning to the Gators. He’s now excelling as a wide receiver for the Eagles, who selected him in the fifth round of the 2010 NFL draft. Five rounds after they chose Cooper, the Phillies selected Brown. Ironically, he too, played the same sports. He was a wide receiver at Redan High School in Stone Mountain, GA, and had planned on continuing his football career at the University of Miami. Unlike Cooper, he chose baseball, getting a $200,000 signing bonus. 30 years ago, RHP John Denny became the ace of the Phillies who made it to the world Series. Denny went 13-1 after the All-Star Game to finish with 19 wins, the most in the National League. At the end of the season, he won the Cy Young Award. When we had a press conference to commemorate John winning the award, we had him pose with one of Lefty’s awards. Instructions for Denny: hold your fingers over Lefty’s name for the photo op. Don’t blame me for the tomfoolery. Vince Nauss, assistant PR director then, gets the credit. Check out the photo and list of Phillies major award winners at http://www.phillies.com/alumni. 60 years ago, a young core of the Whiz Kids could only muster a third-place finish despite being in the prime of their careers. You’ll find the story of the 1953 team in the continuing series of Phillies seasons that ends in a 3. 70 years ago Saturday (November 23), the Carpenter family of Wilmington, DE, purchased the Phillies. That story will be posted in the Alumni webpage later today. Shopping season for the holidays is underway. Once upon a time, that season didn’t start until after Thanksgiving but times have changed. 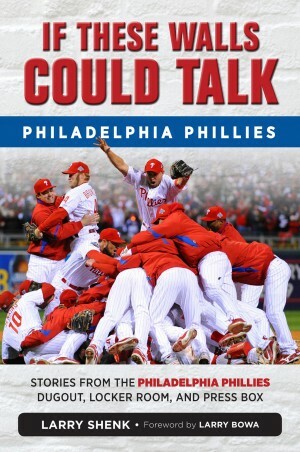 If you are looking for a special gift for a special person, here’s a list of books relating to the Phillies. Happy shopping. The Mouth That Roared by Dallas Green and Alan Maimon; foreword by Jayson Stark; Triumph Books; also available in kindle. 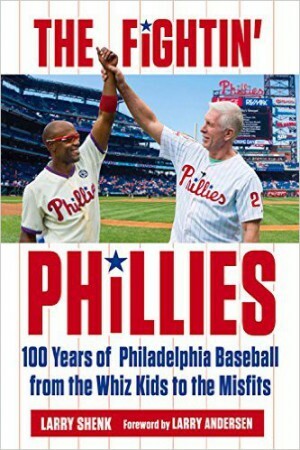 Philadelphia’s Top 50 Baseball Players by Rich Westcott; foreword by Dallas Green; University of Nebraska Press. Shibe Park/Connie Mack Stadium by Rich Westcott; Arcadia Publishing. View from the Booth by Chris Wheeler; Camino Press. Marlon Byrd’s come back to his roots. The veteran outfielder who once wore #2, will be wearing #3 this time around. The right-handed power-hitter with a .280 career average was the first major free agent signee earlier this week. It certainly has created a buzz. Todd Zolecki’s initial story drew 880 comments as of this morning. Some of comments were positive, others opposite. Fans at least care and have opinions. Some of writers too offered similar responses. As Ruben has said so often, we have a lot of holes to fill. Byrd filled one, leaving salary room for other moves. Last winter the Red Sox signed the likes of Shane, Napoli, Gomes, Drew, multiple unsexy signings rather than one or two major sizzlers. It kind of reminds me of the 1993 Phillies. Danny Jackson, David West, Larry Andersen, Milt Thompson, Pete Incaviglia and Jim Eisenreich were obtained prior to spring training 20 years ago. Byrd was our 10th round selection in 1999. When we opened Citizens Bank Park 10 years ago, he was our starting centerfielder. As the lead-off hitter, he was the first Phillie to bat, grounding out to second base. In his second at-bat (third inning) he walked and stole second, the first steal in the new park. Now, he’s back and his bat will be in the middle of the order, an experienced right-handed bat, something we needed. Once inch down with a few more inches to go. Connect: transitive and intransitive verb to join two or more people, things, or parts. Say hello to social media. Remember when the internet world came along? What a great way to connect with fans–news, photos, blogs, message boards, chats, videos, listening to and watching games on a computer. Ticket and merchandise sales boomed. But the ever-changing world of technology has expanded, putting our daily lives in the middle of social media–twitter, facebook, pinterest, instagram, tumblr, google+ and the latest, vine. Social media seems to grow faster than weeds. For the Phillies, social media is becoming bigger and bigger. We’re among the top MLB teams when it comes to followers. Over 1.3 million follow us on facebook and that number keeps climbing. Social media opens a new world for advertising and sales. Learned at the club’s advertising meeting last week we’ll still advertise in print, radio, TV and billboards but social media is moving along faster. Among the new items for holiday sales is a Phillies Gift Card. Hey, gift cards are big. I now get them every birthday and Christmas. Now, fans can buy a Phillies gift card that can be used or tickets, merchandise or concessions at Citizens Bank Park. These gift cards are available under tickets at http://www.phillies.com. Check them out. Perfect stocking stuffer. As a kid, I became a big Phillies fan by connecting through newspapers and radio, more or less now a pair of dinosaurs. Speaking of dinosaurs, I must be one. To me, tumblr is what I use every morning for drinking orange juice. And, as a young PR person many moons ago, social media meant buying drinks and dinner for the media. Altherr had a big game yesterday in the Arizona Fall League, two doubles, a single, three runs scored and a stolen base in five at-bats. He’s been slowed by a thumb injury. Jim Salisbury reports that Quinn, 20, has ruptured his right Achillies tendon and C Tommy Joseph has been cleared (concussion) to play winter ball. He last played on July 4. Quinn was injured running sprints near his Florida home. He’ll most likely miss most of next season. He stole 32 bases in 67 games last summer at Lakewood, a season cut short when he was hit by a pitch on June 24 and sustained a fractured bone in his left wrist. Ruben’s just finished spending time watching the Phillies prospects in the AFL. Next week (Monday through Wednesday) he’ll be at the GM meetings in Orlando and then spending a day at the MLB owners meetings also in Orlando on Thursday. MLB’s Industry Meetings will be in Orlando from Sunday through Wednesday. Each club will send 20-25 employees to participate in the meetings. Among the numerous departments are advertising, sales, ticketing, public relations, video, ballpark operations, promotions, fan development. Then baseball’s annual winter meetings, which includes the minor leagues, will take place December 8-12. Where? Orlando. 70 years ago the Phillies had a bizarre year that included three ownership changes, two managerial changes and 43 double-headers during World War II when rosters were depleted by the military. You can read about the 1943 season at http://www.phillies.com/alumni. Included is a terrific photo of two Hall of Fame managers, courtesy of Bob Warrington, baseball historian and collector. While the NFL, NHL and NBA regular seasons are underway, baseball is entering its offseason. Well, perhaps it is better known as the shopping season. Something like 147 free agents can sign with new teams. No other sport can match baseball’s rumor mill or July trading deadline media frenzy. A week ago, the NFL trade deadline came and went in a yawn. Only one deal, the Eagles sending a defensive lineman to the Patriots for a future draft pick. Despite little activity, I don’t recall one single rumor. Baseball writers feed the rumor mill. Each tries to out-do the other. Scoops more often turn into bloops. There’s a website, http://www.MLBTradeRumors.com, which specializes in rumors. Tim Dierkes, one the site’s writers, posted his predictions for the top 50 free agents for the third straight year. Fans can get into the predicting act, too. 5,239 fans participated last year. According to Tim, the Phillies will wind up signing outfielder Nelson Cruz, right-handed starter Ricky Nolasco, right-handed reliever Edward Mujica and re-sign Chooch. Tim has Doc Halladay signing with the Mets. Time will tell. OF Cameron Perkins, playing for the Peoria club in the AFL, was beaned on Friday but returned to the lineup the next day. First at-bat? Hit by a pitch again. He finished that game with three hits and three runs scored . . . C Cameron Rupp is hitting .324 for the same club. Greg Luzinski is being inducted into the Philadelphia Sports Hall of Fame on Thursday night. As a youngster growing up in New Jersey, Mark Leiter was a Phillies fan. As a player he spent two years wearing that uniform. Now, Mark Jr. is a young pitching prospect in the Phillies minor league system. Check out a feature about the Leiters written by Paul Hagen at http://www.phillies.com/alumni. The new Peek at the Past photo on the same webpage features the Sarge being interviewed on national TV after the Phillies eliminated the Dodgers in the NLCS 30 years ago.